New fridge cabinet along with a built in micro cabinet. 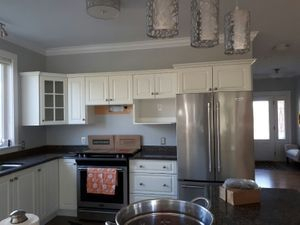 Custom shaker crown was added to upper cabinets. Notice new flooring was added to tie in both rooms. 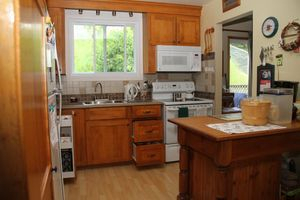 Customer request was to create countertop space to the right of stove with additional drawers. 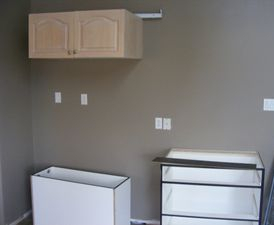 Eliminate wine storage cabinet. Build a cabinet for cookbooks. Add a new floor and wall tile. 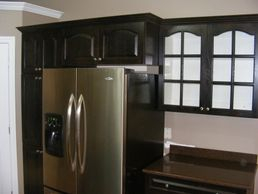 New deeper pantries with coffee serving bar. Acid glass gives the cabinet doors some interest. 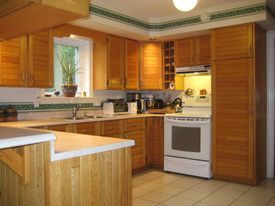 This 1980's style kitchen was updated with new solid natural birch doors and a silestone countertop. Moved Pantry added extra countertop surface. Original solid oak natural finish doors. Original solid oak golden oak colour finish doors. Solid raise panel birch door stain dark coffee. New laminate countertop. Formica FX series. Small bathroom vanity re-dooring job. 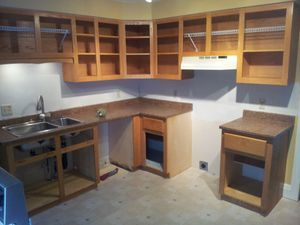 Replace vanity countertop. 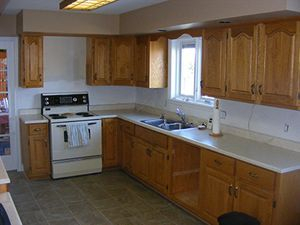 Kitchen cabinet remodeling with new kitchen cabinets was required in this job. 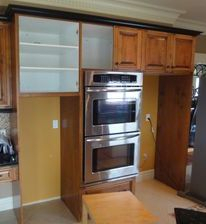 New kitchen pantry with built in rollout package. New fridge cabinet along with custom glass door cabinet. Average height of tall pantry cabinet is 84". Standard height of base cabinet is 34-1/2" with countertop 36" finsih HT. 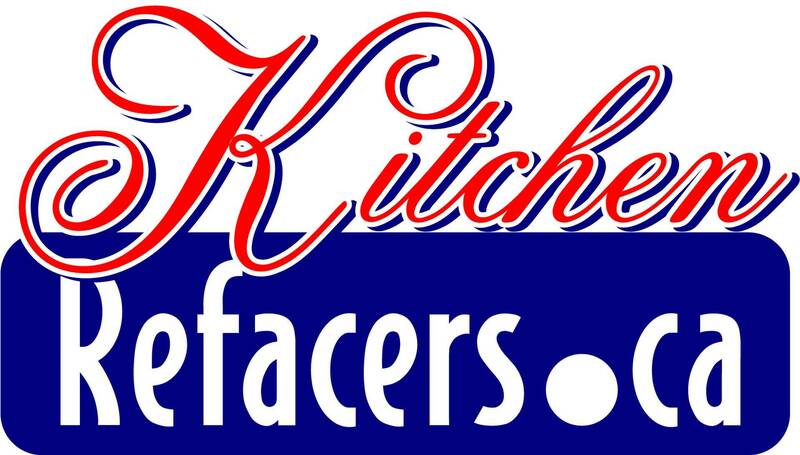 Here is a Kitchen Makeover idea. 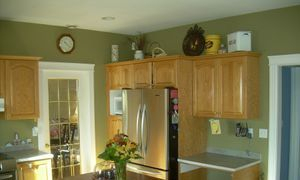 Custom built in add on pantry with new kitchen cabinet doors and end panel to hide the left side of refridgerator. 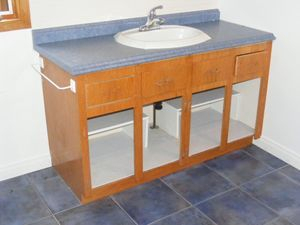 This small bathroom vanity is an older style cabinet contructed in the 80's. 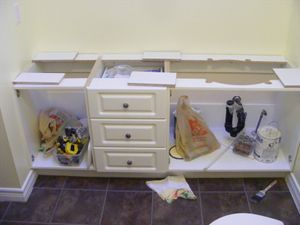 The small bathroom refacing photo shows a simple re-dooring job. 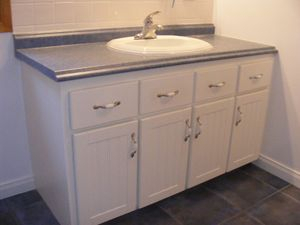 The vanity was painted and concealed hinges were installed. With a Pantry for storage. Custom wall unit with acid etch glass. Door/Drawer combination for extra storage. 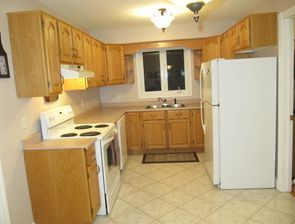 Before and after kitchen cabinet makeover. 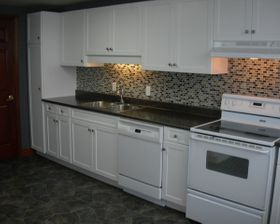 In this photo customer wanted a quick simple update for this rental unit. 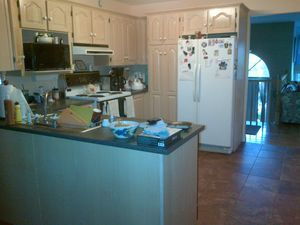 Kitchen Cabinet door replacement was completed along with new hinges and handles. Customer replaced flooring and wall tile. 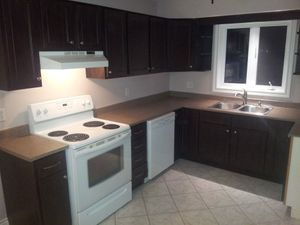 A typical oak light colour stain kitchen. Colour name is Chocolate pear. Door style is shaker. 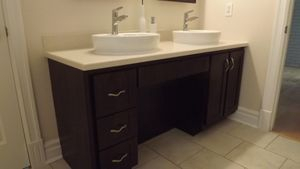 In this before after bathroom makeover we refaced this cabinet with a laminate called Chocolate Pear. 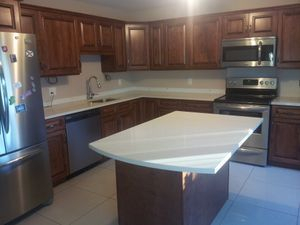 Counter top was replaced with corian and top mount bathroom sinks. Face frame small bathroom vanity renovation. Small bathroom cabinet. Corian countertop with top bowl sinks. 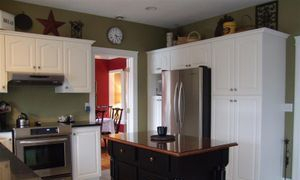 In these cabinet refacing photos we ordered custom unfinished doors then applied a custom stain to match the existing cabinetry. 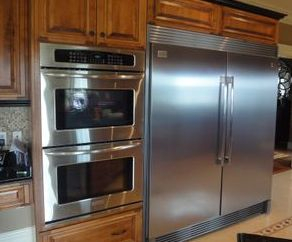 A common request we receive is to alter cabinets sizes for new appliances. 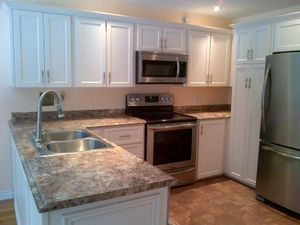 Other opening modifications are available for..
A Halifax kitchen renovation job well done. One adjustable shelf is not a well organized cabinet. Solid cabinetry just needed new door fronts. 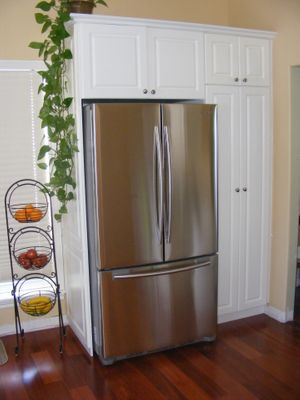 Fridge size opening was created by shortening the upper cabinets and converting them to a pull up hinge door system. 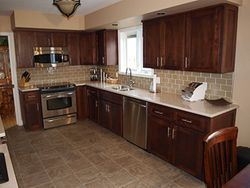 For more before and after photos see these beautiful kitchen designs. 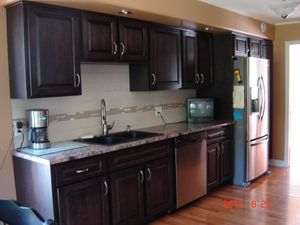 This kitchen is refaced to a chocolate white vinyl door with glass doors. Solid cherry raise panel door with matching drawer fronts. 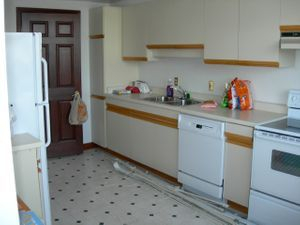 Last minute change was to relocate refrigerator to separate wall. 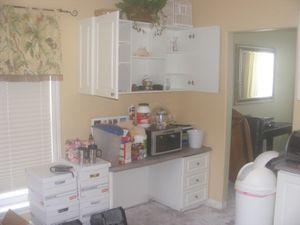 With surrounding pantries. 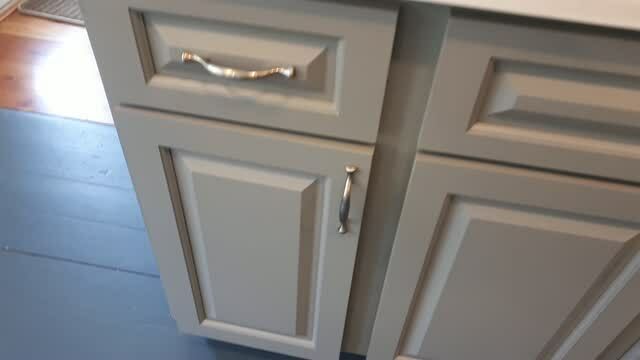 White shaker style door with crown moulding package. New microwave location. FX series style countertop. New appliances. 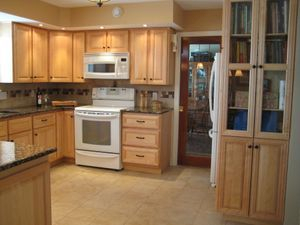 Doors are solid birch stain, Add in island, over the range microwave, Silestone Countertop. Maximizing storage in this large base cabinet is better with no wasted space. New Drawer and door fronts. Also we raised the countertop by 3". 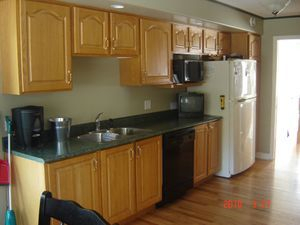 We installed a countertop cabinet which increase even more storage.